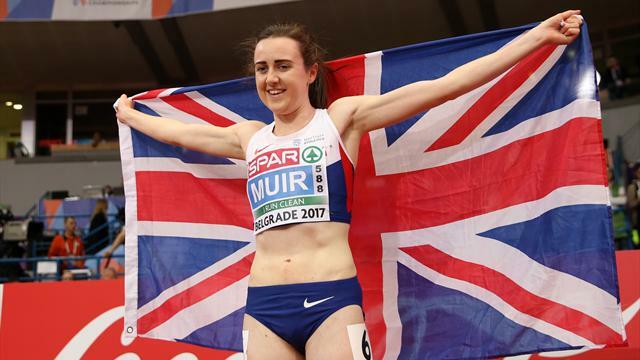 Great Britain’s Laura Muir secured a golden double at the European Indoor Athletics Championships in Belgrade whilst Asha Philip took gold in the 6om final. The Scot, who had triumphed in the 1500m on Saturday, hit the afterburners with 500m to go and sprinted clear to claim the title by a distance. The 23-year-old's turn of pace was particularly impressive given that the final came just a day after Muir's first gold (and headline grabbing lap of honour). And Muir wasn't the only Brit on the podium, with Eilish McColgan showing a similar turn of pace on the final lap to take bronze. "I knew it would be a tough race with Can and that she would probably take the race to me and I just tried to hang on," a delighted Muir told reporters. "I pushed as hard as I could in the last 200 metres and was just relieved when I crossed the finish line. "I am delighted to be part of the British team doing so well here." Asha Philip added to Britain's gold medal tally as she won the women's 60m final. She recorded a time of 7:06 which was the fastest in Europe this year and a new British record. She beat out Olesya Povh of Ukraine and Ewa Swoboda of Poland who both registered 7:10. “There is always that scare factor when they come and you cross the line - I heard my name, but you don't believe it until you actually see it! Oskan-Clarke tried to overtake Buchel, who led the race, but the Swiss was having none of it and stood her corner. She fought to the end though and pushed Buchel so close that it had to go to a photo finish. Her time was 2:00:39 which was incredibly just one millisecond away from Buchel's 2:00:38.